6:35 a.m. — A resident in the 100 block of Carmel Avenue reported a neighbor’s dog had been barking for three hours. 2:49 p.m. — A resident in the 600 block of South Market Street reported the neighbor’s kids were throwing stuff in his yards. And officer spoke to everyone and urged them to solve their problem on their own. 5:14 p.m. — Police searched for a person allegedly breaking into a home 200 block of East Payne but did not find anyone. 5:33 p.m. — Police responded to a report of kids messing with a pile of stone that had been stored and was not to be played with. 6:42 p.m. — Police investigated a report of a person being threatened by a former acquaintance. 9:53 p.m. — A resident in the 200 block of Gill Avenue reported someone added a bunch of trash to his own trash. 10:04 p.m. — A verbal warning was issued to a man in Heise Park for loud music. 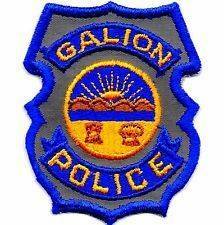 12:59 p.m. — Police investigated an alarm going off at Galion Primary School, 478 Portland Way North. 4:20 p.m. — Police received a request for a person trying to get mail from a relative in the 200 block of Mansfield Street. 4:37 p.m. — A report was taken in the 500 block of First Avenue about a resident being threatened by a man in Crestline, who said he had a knife and was coming over to get some “drug stuff” that was left there. 4:44 p.m. — Police received a call for assistance for a resident in the 500 block of Sherman Street who had fallen. 5:26 p.m. — A resident in the 700 block of Maple Heights reported that someone in the neighborhood was selling drugs. 6:42 p.m. — Police were unable to find a boy who reportedly was very sick in the area near the overpass on Each Church Street. 10:57 p,m. — Police took a report about a person in the 200 block of Portland Way North who appeared to be under the influence of drugs. 11:18 p.m. — A report of six people getting ready to fight, in a parking lot at the 800 block of Portland Way North, was investigated. 2:35 a.m. — A report was taken about a person in the 100 block of Harding Way East who reported accidentally used another person’s ATM card. 8:44 a.m. — A report was taken in the 100 block of North Columbus Street from a person who’s ATM account had been accessed by someone in Canada. 11:54 a.m. — Police responded to a call from a Wyandot County about someone in the 300 block of North Market Street who had threatened to hurt himself. 12:49 p.m. — A resident in the 100 block of Harding Way East reported that a computer he had from a local rental agency had been taken from her apartment by an employee the rental company. The woman’s money was refunded and no other action was taken. 1:39 p.m. — Police reported finding a bunch of stolen stolen property in the 200 block of East Payne Avenue. Police said the sheriff’s department in Crawford County and Morrow County will handle the incident. 3:01 p.m. — Police advised the owner of a dog in the 400 block of Euclid Avenue to do a better job keeping the dog contained. 3:50 p.m. — Police investigated a call from the 1000 block of Fairview Avenue who was threatened by a man who pulled a knife and keeps driving around the complainant’s home. 4:26 p.m. — A resident in the 200 block of Sherman Street reported that an neighbor was harassing him while he was cutting the grass. Police returned to the scene after another report at 7:44 p.m.
6:36 p.m. — Police investigate a report of gunshots in the neighborhood around the 500 block of Third Avenue. 8:45 p.m. — After receiving a report of a man threatening a tenant threatening a landlord, police issued summonses to a man for possession of drugs and possession of drug paraphernalia. 7:26 a. m. — A resident in the 300 block of West Atwood Street reported a lawnmower had been stolen. 10:05 a.m. — A food st a.m.p card was found along Portland Way South and turned over to police. 2:09 p.m. — A man reported to police that his girlfriend was “breaking everything” and then tried to run over him with a car. The man was advised to leave the residence. 15:43 p.m. — After responding to a domestic disturbance in the 100 block of South Street, a 30-year-old man was taken to the Crawford County Justice Center. 16:39 p.m. — A report of people throwing stuff from a house into the yard. Police determined it was a civil dispute and took information for a report. 16:44 p.m. — A reported was received about a man who backed his car into another care in the 600 block of Harding Way East. Police were called because the man who reportedly caused the accident was yelling and cussing at the person driving the car he hit. 6:09 p.m. — Police talked to a person who’s dog was reportedly locked in a hot car. 8:13 p.m. — A verbal warning was issued after a report of loud music in the 200 block of North Columbus Street was received. 10:05 p.m. — After receiving a report of “a drunk fool walking on 60 toward 309” police arrested a 31-year-old man on an outstanding warrant. 10:42 p.m. — Police received a report of people setting off fireworks in the 300 block of West Atwood Street. 11:13 p.m. — A resident in the 400 block of South Union Street reported a dog barking for three hours. 1:02 a.m. — After responding to a report of fireworks being set off and a large bonfire, police arrested a 25-year-old man on charges of resisting arrest, disorderly conduct and obstructing official business. 4:14 a.m. — A resident reported someone trying to break into a bedroom window in the 400 block of Portland Way South. 4:10 p.m. — A verbal warning for disorderly conduct was issued to a man after police responded to a report of a man throwing things “around and into the roadway. 7:48 p.m. — Police investigated a report of fireworks going off in the area of Koppe Court and Cherry Street. 8:05 p.m. — Police investigated a report of fireworks going off in the 400 block of South Boston Street. 10:45 p.m. — Police issued a citation to a woman for driving under suspension after they received a call off a possible-impaired driver near the intersection of Ohio 309 and Ohio 61. 9:06 p.m. — Police took information for a report after a woman in the 200 block of Grove Avenue reported that her son has been assaulted by another kid in the 300 block of South Boston Street. 10:22 p.m. — Police received of a suspicious vehicle in the area pf East Payne Avenue and Liberty Street. The driver was reportedly yelling obscenities. 2:42 p.m. — Police removed a mattress from the road on East Payne Avenue. 3:07 p.m. — An ATM card accidentally left in a machine at United Bank on Public Square was reportedly used by someone other than the owner of the card. 4:30 p.m. — A dog was reported poisoned with antifreeze in the 400 block of North Market Street. 9:15 p.m. — Police responded to a report of gunshots in the 1000 block of S. Market Street and told the residents that it is illegal to fire guns within the city limits. 10:39 p.m. — Police, responding to a report, were unable to find anyone shooting off fireworks in the 500 block of Gill Avenue. 12:16 a.m. — A warning was issued to a man who was reportedly looking into vehicles in the 300 block of South Union Street. 9:40 a.m. A report of two juveniles fighting in the area of Woodlawn and Prospect streets was investigated. 10:32 a.m. Officers investigated a motorcycle accident at W Mansfield and Crawford streets. 2:03 p.m. A report of kids riding across traffic on S Sandusky Ave was unfounded. 2:09 p.m. A report of a possible gun shot heard in the north end of town was investigated. Nothing was located that indicated a shot was fired. 3:38 p.m. A report of a juvenile trying to start a fight in the 200 block of E. Mansfield Street was investigated. 4:14 p.m. A Bucyrus resident c a.m.e to the Police Department to report a property issue with her landlord. 5:03 p.m. A hit skip accident in the 500 block of Prospect Street was investigated. 5:34 p.m. A resident in the 400 block of Charlotte Street reported someone at his residence who was refusing to leave. The subject was gone before officers arrived. 7:28 p.m. A verbal warning was issued for loud music in the area of Woodlawn and Wiley Street. 10:11 p.m. A report of someone shutting off a breaker box at Morgan Manor was investigated. 10:56 p.m. A report of pedestrians yelling in the Woodlawn Ave. area was investigated.